Live Wall Media specializes in turnkey video walls that are designed for 24/7 mission critical control room applications. Our solutions combine our crisp clear LCD panels, flexible wall mounts, and state of the art video processors into systems that are powerful and easy to operate. Collaborate and share important information with key personnel in real time. Live Wall Media has decades of experience testing and evaluating video products and have developed simple, reliable, and cost effect solutions for implementing control room solutions. We value your business and will provide you with superior service and support. 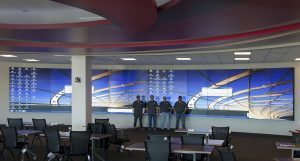 Live Wall Media video walls at work!